Few people know, but at the origins of the most famous in the world of Intel and Pentium were Soviet experts and engineers. In due time the USSR has made quite significant achievements in the development of computer technology. An example of this is a series of Soviet supercomputers "Elbrus", which were created in the Institute of precise mechanics and computer technology (ITM CT) in 1970-1990-ies of the last century, it's name is a series of microprocessors and systems designed and manufactured today ZAO MCST (Moscow center of SPARC technologies). The history of company "Elbrus MSCT" began in 1992, when Babayan with his colleagues and with the participation of David Ditsele, who was then working at Sun Microsystems, organized a "Moscow center of SPARC-technologies". Later, with the participation Babayan were created by several companies: "the Elbrus 2000, Elbrus international", which form "Elbrus MCST". The company has been working on the orders of foreign companies: Sun, Transmeta (that this company has moved with the times David Dietzel), and also carried out work on the orders of the Russian government. First of all, it is used in the Russian army computing systems "Elbrus 90-Mikro" on the base of own series processors MCST R. For their creation Babayan and his colleagues at the time, received state awards. However, the history of the "Elbrus"is much longer. The first computer with this name was created in 1978, Assigned to them. S. A. Lebedev, USSR Academy of Sciences under the leadership of B. S. Burtsev and with the participation of Boris Babayan, who was a Deputy chief designer. The main customers of computers "Elbrus"were, of course, the military. The first computer "Elbrus" had a modular architecture and can include from 1 to 10 processors on the basis of the average integration schemes. The performance of this machine has reached 15 million operations per second. The amount of RAM, which was common to all 10 processors, up to 2 to the 20 words or, if you apply the notation, 64 MB. However, the most interesting in "Elbrus-1" was its architecture. Created in the USSR supercomputer became the world's first commercial computer that used a superscalar architecture. Its mass use abroad began only in the 90-ies of the last century with the appearance on the market of available processors Intel Pentium. As it turned out later, a similar design existed before "Elbrus" in IBM, however, these works were closed and have not led to the creation of a commercial product. However, in a number of publications appeared information that the design of the "Elbrus" is based on the development of foreign firms. However, the participants in the creation of the Soviet supercomputer with such position do not agree. In an interview, V. S. Burtsev, the chief designer of "Elbrus", noted that the creation of computer designers tried to utilize the best practices of both domestic and foreign developers. And architecture "Elbrus" has influenced not only the computer firm Burroughs, but also the development of firms such as Hewlett-Packard, as well as the experience of BESM-6. A considerable part of the design was original, and superscalar architecture. In addition to transmission of data streams between peripherals and main memory in the computer could be the processor I / o. Such processors in the system could be up to 4 pieces, they worked in parallel with the Central processor and had its own memory. The next step was the creation of the computer "Elbrus-2". These computers went into mass production in 1985. In their domestic architecture they are not very different from "Elbrus-1", but used new components, which allowed to increase the maximum capacity of up to 125 million operations per second. The amount of RAM the computer has increased to 72 million 16-bit words or 144 MB. The maximum bandwidth I / o "Elbrus-2" was 120 MB/s. These computers are actively used in the USSR in the areas that required a lot of calculations, especially in the defense industry. The computer "Elbrus-2" was operated in nuclear research centers in Chelyabinsk-70 and Arzamas-16 at MCC, finally, it is this complex, since 1991, been applied in the system A-135 missile defense and other military facilities in the country. In addition to the two above computers, also produced General-purpose electronic computer "Elbrus 1-KB", the creation of this computer was completed in 1988. Until 1992 it was produced 60 such computers. They were based on technology "Elbrus-2" and was used to replace obsolete machines BESM-6. In this case, between "Elbrus 1-CB" and BESM-6 were backward software compatibility, which has been supplemented with new modes of operation with an increased length of numbers and addresses. The creation of computers "Elbrus" was appreciated by the leadership of the Soviet Union. For the development of the "Elbrus-1" many engineers were awarded orders and medals. Boris Babayan was awarded the Order of the October revolution, his colleague V. V. Bardie – the order of Lenin. For the development of the "Elbrus-2" Babayan with a number of his colleagues was awarded the Lenin prize, General designer V. S. Burtsev and a number of other professionals State award. After the completion of the computer "Elbrus-2" Assigned to undertook the development of computers based on a radically new processor architecture. The project, which was called simply – "Elbrus-3", also significantly ahead of similar developments in the West. "Elbrus-3" was first implemented the approach that Boris Babayan calls the "postsparkasse". It is this architecture in the future had the Intel Itanium and the Transmeta chips. It should be noted that in the USSR, work on this technology began in 1986, and Intel, Transmeta, and HP started the implementation works in this direction only in the mid 1990-ies. Unfortunately, "Elbrus-3" never was put into production. Its the only working copy was built in 1994, but this time he was not wanted. A logical continuation of work on the computer was the appearance of the processor "Elbrus-2000", also known as E2K. According to Boris Artashes Babayan, the chief architect of the line supercomputers Elbrus, the superscalar architecture was invented in Russia: "In 1978, the year we built the first superscalar machine, the Elbrus-1. Now in the West do superskalyary just such an architecture. The first superscalar in the West, appeared in 92nd year, our in 78. Moreover, the variant superscalar, which we did, similar to the Pentium Pro that Intel made in ' 95 the year". Confirm the historical primacy of Elbrus and in America. In the same article from Microprocessor Report kit Diefendorff, the developer of Motorola 88110-one of the first Western superscalar processors, writes: "In 1978, almost 15 years earlier than appeared the first Western superscalar processors, Elbrus-1 was used processor, with issue two commands in one cycle, changing the order of execution of commands, renaming registers and execution by assumption". In 1991, in mount Elbrus (ITM CT) visited Mr. Rosenbladt (Peter Rosenbladt) from Hewlett-Packard, and has received detailed documentation on the Elbrus-3. It turned out later, that's when HP started the project that led to the joint development with Intel EPIC processor Merced. Its architecture is very similar to Elbrus-3, and the differences are mainly related to the simplifications made in the microprocessor from Intel. According to B. A. Babayan, Peter Rosenbladt proposed cooperation with HP. But Babayan chose Sun (the first meeting with the leadership of the Sun took place back in 1989). And in 1991, with the Sun was awarded the contract. 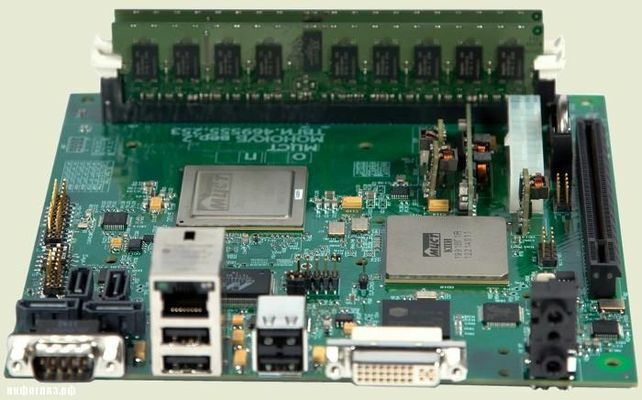 From the official representatives of the Sun it is known that the Elbrus has participated in the development of the microprocessor UltraSPARC, optimizing compilers, operating systems (including Solaris), tools Java, multimedia libraries. Initially the project E2k sponsored by Sun. The project is now fully independent, all intellectual property belongs to Elbrus and protected approximately 70 U.S. patents. BA Babayan says,"If we continue to work with Sun in this area, all belonged to Sun. Although 90% of the work was performed before the advent of Sun". The Sun from 1992 to 1995 Elbrus worked with the famous microprocessor architect Dave Dietzel. As told by B. A. Babayan, "Then Dave formed his own company — Transmeta and began to work on his car, very similar to ours. We continue to support with Dietzel in close contact. Yes and he really wants to cooperate with us". About future product Transmeta yet little is known. It is known that it is a VLIW/EPIC processor with low power consumption, binary compatibility with x86 provides dynamic translation of object code. 64-bit Intel Itanium processor did not meet expectations and on paper much inferior "Elbrus-2000". From 1994 to 1998 on the work of the team of Boris Babayan was not heard — the Russians were preparing a sensation. In 1998, without much fanfare Babayan and Co (approximately 400 employees) renamed the company "Elbrus". Meanwhile, foreign competitors were not sleeping. In 1989, Intel and Hewlett-Packard have joined forces to create the next generation processor — the Itanium (code name Merced). Itanium was supposed to absorb all the latest developments and become the crown of protsessorostroeniya. Many expected the new processor will dominate the market of servers, workstations and possibly desktop computers, displacing all others. Project Merced frequency equal to 800 MHz, the level of heat is 60 watts, and the volume cache of the third level — from 2 to 4 MB. This CPU was supposed to be 64-bit. Very real processor from MCST R500 was a faded echo of the promising "Elbrus-2000". Day X came on 25 February 1999, when at the conference, Microprocessor Forum went up to the podium personally Boris Babayan and loudly stated that his company has developed a microprocessor "Elbrus-2000" (E2K), strongly outpacing the much-vaunted Merced in all ways. All the public computer stopped waiting. Instead of the planned two hours Babayan performed for four hours. Sounded answers to questions about competition from Western companies and prospects to market of microprocessor and computers based on it. At some point Boris Babayan shocked the audience, saying that the money for the production of a test batch processor "Elbrus-2000" it is necessary $60 million, a figure that scared off all potential investors. Still, after all the promises Babayan was pure theory, no engineering samples and prototypes has not been demonstrated. The legend of the computer world Gordon bell (Gordon Bell), who, working in DEC, created computers of the PDP and VAX lines, and now heads the research division of Microsoft (Telepresence Research Group), and promotes the Elbrus E2k project at international conferences. His lecture, titled "the Next decade of supercomputing" (The Next Ten Years in Supercomputing) on 26 may 1999 opened the international Symposium on High performance Computing (International Symposium on High Performance Computing) in Japan, and June 10 — Mancharovskoe fourteenth Conference on Supercomputers (Supercomputer Conference, Mannheim) in Germany. Both times Dr. bell part of the lecture devoted to the story of E2k. In a slide titled "Russian Elbrus E2K" he gives a table which evaluates E2k and Merced. A comparison shows clearly not in favor of the offspring of Intel. Below is a table from the report of Gordon bell. Gordon bell (www.research.microsoft.com/users/gbell/bio.htm) is not only a senior employee of Microsoft, but influential in the computer world, consultant and entrepreneur. He created several private companies involved in the development of promising technologies. Claimed performance, meanwhile, was impressive. The company "Elbrus" promised the processor with frequency of 1.2 GHz, the performance of which was equal to 8.9 billion operations per second. In addition, the developers have calculated that E2K has three times to beat Merced in the tests SPECint95/fp95. The die size was only 126 mm2 for heat dissipation is 35 W, whereas Merced took 300 mm2, and the dissipation he had 60 watts. The Russian company had big plans for serial production of this processor, which was supposed to go in series at the same time or even earlier than Itanium. But due to the lack of necessary investments, all these plans were not implemented and remained on paper. Vladimir Pentkovsky is an outstanding Russian-American scientist, doctor of technical Sciences, graduated from the faculty of MIPT interests of students. He was directly involved in the development of processors Pentium III, Core 2 Duo, HAL9000, Matrix developer of high-level programming language El-76, which was used in computers "Elbrus". Since 1970 he worked at the Institute of precision mechanics and computer engineering, where he managed to participate in the creation of supercomputers "Elbrus-1 and Elbrus-2". In 1986 Pentkovsky headed work on creating a 32-bit CPU al-90 for "Elbrus-3". By 1987 the work on building the architecture of a new microprocessor was completed in 1990 was released the first of its prototypes. In 1991 he began work on the development of al-91S, which is based on previous version of the processor, however, the funding for the project was stopped because of the collapse of the country. Naturally, the specialist at this level could not divide. In 1989, Vladimir Pentkovsky have traveled in the USA in research centre Intel in the framework of the programme for the exchange of experience. Since 1993 he starts to work at Intel, becoming one of its leading engineers, the development of the famous Pentium occurred with his direct participation. The presentation of the Pentium took place on 22 March 1993, about a few months began to appear the first computers constructed on their basis. Vladimir Pentkovsky is one of the authors of vector (SIMD) extensions SSE commands, which was first used in the Pentium-III. He is the author of more than 50 different patents, many of which are still used in modern processors. In Intel Vladimir Pentkovsky embodied in practice the knowledge which he obtained in Russia, many think it already during modelling. In 1995 an American company introduced a better product the Pentium Pro, which according to its characteristics resembled the processor El-90. The chief architect of this processor is Vladimir Pentkovsky. Currently Pentkovsky continues to work at Intel. So the processor on which you may have your personal computer or laptop may have Russian roots and could even be produced in our country, if not for the infamous events of 1991 and their consequences. Although the USSR collapsed, the brand "Elbrus" is still alive. Processors and solutions based on them today promote on the market the company MCST. To date, the company MCST computers are mainly designed for: the military departments of Russia, CIS and BRIC countries; industry civil proceedings; radars for civil use (land, sea and air transport). For business and civilians who require extremely reliable and secure computers. The computers have different design execution, different class protection, depending on requirements. All of them have the support or ability to work with GPS and GLONASS, depending on the needs of the buyer device. Currently the company markets its core 2 microprocessor and devices on their basis. The first one is Elbrus-2S+, which is the first high-performance hybrid processor company MCST. The processor contains two cores architecture Elbrus and Quad core digital signal processors (DSP) company Elvis. His main area of use is a system of digital intelligent signal processing, which include image analysis, radar and other similar devices. The second product is a microprocessor MCST R1000 (project name MCST-4R) – Quad-core model, built on a chip with 64-bit SPARC v architecture.9. The processor operates at a frequency of 1 GHz with technological standards of production of 90 nm. Each of its cores is able to decode and send to execute up to 2 instructions per cycle. The processor supports additional instructions to perform Packed and combined operations, as well as vector extensions VIS1 and VIS2. In December 2012 was released the first Russian processors that are included in a test batch of candy bars Kraftway. The processors in these candy bars are called "Elbrus", well, purely Russian name. This was told to the CNews Director General of the MCST company which designs processors, Alexander Kim. About plans on release of such personal computers, with Russian processors, it was known in July 2012. Then talked on the MCST and Kraftway companies that were planned to take already ready Kraftway Studio monoblock that contains a touch screen and was going to equip small-sized motherboard, which is called "Monocab", which is the development of the enterprise and MCST contains an embedded processor "Elbrus-2C+". This processor has two cores, which are built based on the architecture of "Elbrus" and have a frequency of 500 MHz, and also contains 4 DSP-core developed by NNC "Elvis", which have the performance of 28 GFlops. By words General Director, Alexander Kim, the first volume of this series, such personal computers will be 50 pieces. And the modules themselves, the company MCST has ordered the production company "Altonika", located in Zelenograd. The CEO reports that will be produced the test data of the modules, for 1-2 months, in order to identify their quality of production. If testing of these modules is successful, the company MCST plans to make my next order, for the production of motherboards, with processors "Elbrus" in the amount of 1000. Alexander Kim says the interest in these computers is large and this batch of 1000 devices, should disperse fairly quickly. Interest, to the computers of the Russian manufacture with Russian processors, mainly showing the organization of the defense sector. What kind of organization, the Director General of the MCST company, not reported. I would also like to mention that the processors "Elbrus" have never been used in computers for ordinary users. The main sales market, the data processors, as mentioned earlier, was the sector of the defense plan. They supply these sectors, the so-called industrial computing systems. These systems are used well in defence. The company MCST has a secure laptop that can be used in severe conditions. The company MCST reported that together with Kraftway, the production of such computers, and want to demonstrate to ordinary citizens.